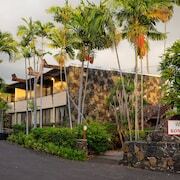 These hotel accommodations are located throughout the area in Volcano. 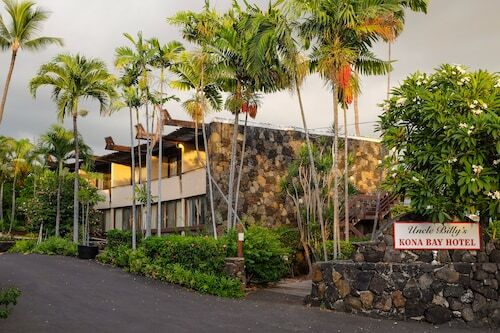 Mauna Lani Bay Hotel and Bungalows is in Waikoloa on the Kohala Coast, a 5-minute drive from Puako Petroglyph Park and 15 minutes from the ruined ancient Hawaiian temple at Puukohola Heiau National Historic Site. 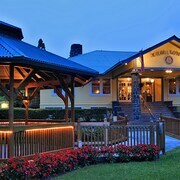 The Shops at Mauna Lani mall is a 2-minute shuttle ride from the hotel. 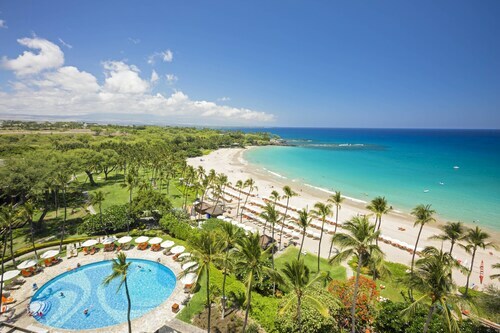 An architectural trend-setter on the Big Island of Hawaii, Mauna Kea Beach Hotel features golf, gardens, and 1,600 Pacific and Asian artworks; Waimea is 13 miles away, and Hawi is 21 miles away. 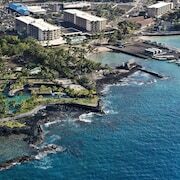 Although Hawaii is the “youngest” of the 50 United States, this lively archipelago boasts a rich history, along with modern luxury and some good clean fun in the sun. While most travellers find Hawaii accommodation on one island and explore every beach and canyon it has to offer, we say go island-hopping, because more is more. 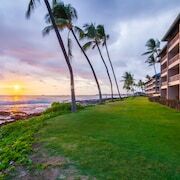 From the monuments in Honolulu and the wilderness preserves of Kauai, to the seaside volcanoes of Hawaii (aka “The Big Island”), you won’t be lacking exciting activities or opportunities to be blissfully lazy. Don’t be fooled by the rugged cliffs and secluded lagoons. 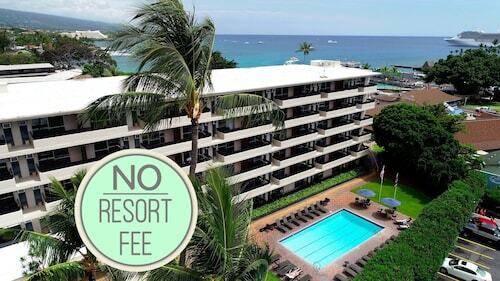 You can take your pick from numerous hotels in Hawaii’s eight main islands, ranging from simple beach bungalows to luxurious resorts. 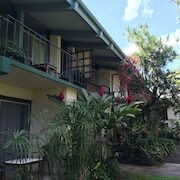 To soak in some maritime history in Oahu, book accommodation near Pearl Harbor, which is within walking distance to several museums and memorials, as well as Aloha Stadium. Most travellers start in Honolulu—on the island of Oahu—a city with easy airport access, fascinating local and national history and delicious eats all along the beachfront streets of Waikiki. We’re talking everything from juicy burgers to fresh seafood and mai tais galore—mai tai, your tai, everybody’s tai! A couple of islands to the east, Maui owns the bragging rights to Haleakala Crater, the rim of which sports unbeatable views of the surrounding forest. Just don’t fall in! When you can peel yourself away from Maui’s Ho’okipa Beach, remind yourself that bigger isn’t always better in Hawaii (just ask the indigenous fiery skipper butterfly). Still, the Big Island is a must-see; pack for a hike so you can visit the Akaka Falls State Park in Hilo and the Volcanoes National Park on the island’s southern coast. After that, if you’re not quite ready to trade togs for real clothes, float on over to Kauai, northwest of Oahu. This hibiscus-shaped island is dotted with accommodation in Hawaii’s secluded rainforests, where you can fall asleep to the sound of waterfalls. While many islands have their own airport, Honolulu International Airport (HNL) is close to beautiful Hawaii hotels and welcomes heaps of intercontinental flights every day. Car hire (especially if you book it with Wotif) is a winning option if you’re not planning to visit multiple islands on one holiday. Rail service is available in Oahu and buses run through all the main islands. Otherwise, you can hail a cab and explore all the top neighbourhoods on foot. To hop from island to island, catch a ferry and enjoy the views as you float by…but first, you’ve got to book those flights to Hawaii! You’ll learn pretty quickly that celebration is a Hawaiian way of life. The islands host several festivals year-round, and since the weather is always awesome, they’re worth planning your holiday around. Hawaii’s balmy summer months are on their way, and with them come loads of excuses to dance, eat like island royalty and get lei-ed. In mid-July, learn to sway and swirl your hips with the best of ’em at the Prince Lot Hula Festival in Honolulu. We can’t believe this graceful dance was ever forbidden, but it was, and Prince Lot brought it back to the island of Oahu. If we had you at “eat like island royalty”, you’ll be happy to hear that you’ll encounter some of the best food in Hawaii at a summer food fest. At the end of July, float out to Kauai for Koloa Plantation Days—a full week of fireside dances, parades, and more seafood than you can shake a stick at. But why would you want to shake a stick when you could use a fork? Don’t worry if you miss an event, though; you can live it up like a local with a Ali'i Luau Dinner Package at the Polynesian Cultural Center in Laie, Oahu. We don’t have to tell you to spend as much of your Hawaiian holiday in the Great Outdoors as you can—the banyan trees and blond beaches will take care of that. Choosing just the right corner of paradise to explore is the real trick. Anywhere you lace up your hiking boots or lay out your towel in the islands will be beyond gorgeous, but if you want to knock your own socks off, spend a day basking in the beauty of Waimea Canyon on the west side of quiet Kauai. 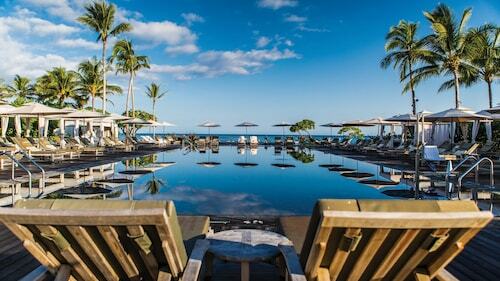 Yes, we said “basking”, because if any place is bask-worthy (other than Basque country in Spain), it’s Waimea. 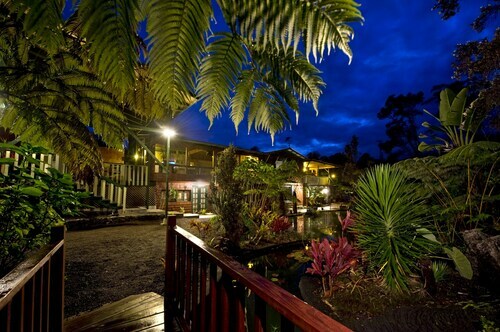 Look out over waterfalls, geysers and just plain luscious landscapes. If you’re lucky, you’ll get caught in a warm afternoon shower and get to gorge on the gorgeous canyon rainbows that make every drop totes worth it. Yeah, you’re welcome. If you have just one day in Hawaii, you’ve obviously got to take that hike through Waimea Canyon and test your surfing skills in Waikiki Beach, but when it’s time to pause and take in some history, Pearl Harbor is a must-visit site. Located 37km west of downtown Honolulu and around West Loch, this quiet dockyard is the site of “a date that will live in infamy”. Today, the ships that suffered in the 1941 attacks serve as memorials and landmarks in United States history. Stop for a sombre tour of the USS Arizona Memorial and the USS Missouri Memorial to get to know Hawaii’s complex role in U.S. national history. 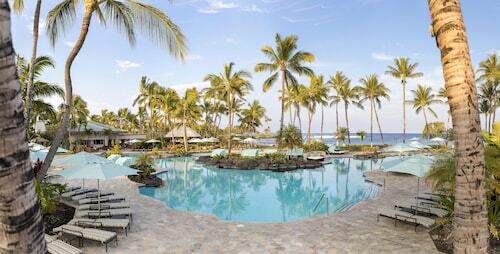 Ready for a Hawaii holiday, but not sure how you can do it all? When you’re wondering how, think Wotif. We’ve found sweet deals on airfares and accommodation, so you can mix, match and bundle the perfect tropical trip. 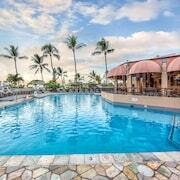 Let us take care of the deals while you scope out the best places to stay in Hawaii for your island bucket list. Isn’t it about time you said, “Aloha”? 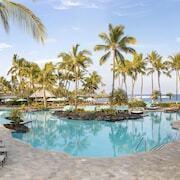 How Much is a Hotel Room in Hawaii Island? 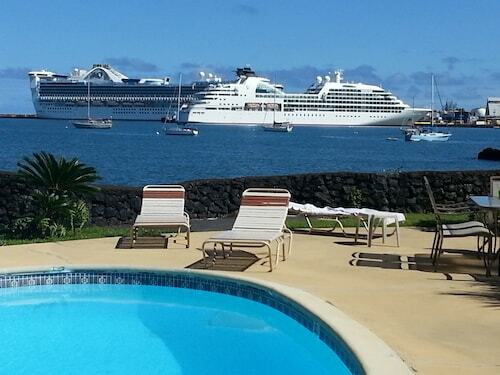 Hotels in Hawaii Island start at NZ$123 per night. Prices and availability subject to change. Additional terms may apply.